Adrian Lewis Peterson (DOB: March 21, 1985) is a famous American NFL star who plays as the running back for the Minnesota Vikings. 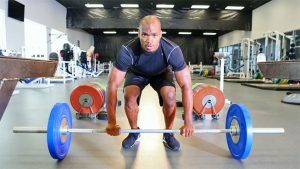 He is a star athlete, who showed his promise while playing college football for the University of Oklahoma. 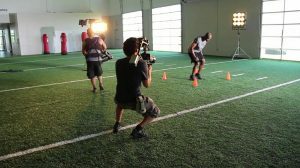 His 40-yard dash time was recorded as 4.4 seconds, which is better than the average duration taken by a running back. Aside from winning many awards and honors during his career, Adrian was named the “NFL Comeback Player of the Year,” “NFL Offensive Player of the Year,” and “NFL Most Valuable Player” in 2012. So, what are the secrets behind his strength, stamina, and ripped physique? Adrian admits that his intense workout routine combined with a strict diet plan has turned him into an ace running back that you see today. 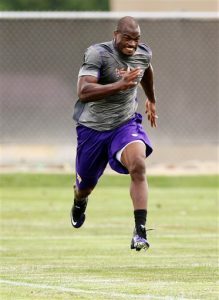 In American football, being fast and explosive is important since the players need to move very quickly. 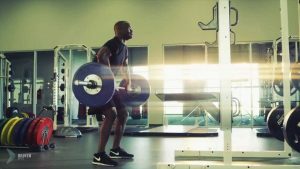 Moreover, a game often lasts several hours and hence increasing endurance by strengthening both the upper and lower-body is essential. The 31-year-old RB hits the gym 5 days a week, his workout regimen being split into different types of compound and isolated exercises that target individual body parts. This helps in strengthening the connective tissues as well as improving functional strength. We witnessed his physical and mental strength when he made a successful comeback from ACL injury in 2011. During the off-season, Adrian concentrates on circuit training without any rest in between exercises. As with any training program, it is impossible to gain mass and get ripped without following a nutritious diet. 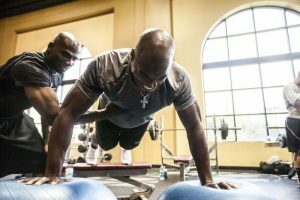 Adrian Peterson follows a strict diet plan comprising protein-rich foods like chicken and fish, along with some supplements that repair his body after strenuous workout sessions thereby promoting muscle growth. To keep him active and ready for a game of football, Adrian takes a lot of high-fiber vegetables, healthy fats, and complex carbohydrates. He divides his food into 6 small meals per day.